For those interested in flutes, Susan played on a couple noteworthy instruments: a 10-key, cocuswood flute, Rudall & Rose (London), c.1835 (from the collection of Rick Wilson of Pasadena, California); and an Edward Almeida modern flute with a boxwood headjoint made by Howel Roberts of Munich, Germany. Dedicated to the memory of Kathy Richmond-Baxter and Jeffrey Richmond, my great aunt and uncle from Scotland who both recently passed away. 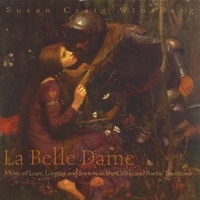 All non-traditional tracks composed by Susan Craig Winsberg. All tracks produced and arranged by Susan Craig Winsberg, Co-produced and engineered by Gilberto ‘Gil’ Morales. Basic tracks for “The Month of January” and “When I am Dead, My Dearest” engineered by Michael Harmon. Additional guitar arrangements by Sean Michael Clegg. Additional arrangements on “When I Am Dead, My Dearest” by Stephanie Bennett. Recorded at the following California studios: Michael Harmon Studio, Oakland; Love Tribe Studios, Van Nuys; J. E. Sound Production, Hollywood; Harpworld Music, North Hills; Outback Studios, Claremont; Studio F, Belair; Kalani Music, West Hills; Talking Drum Records, Santa Monica. Mixed by Gilberto “Gil” Morales at Love Tribe Studios. Mastered by John Matousek at Masterworks, La Cañada, California.